Tomorrow marks the release of Dr. Brant Pitre’s newest book, The Case for Jesus. I am happy to review this book and hope that you are able to get your hands on a copy! In his other works, Dr. Pitre has unlocked the meaning of Scripture and Tradition in light of Christianity’s Jewish roots and now he reveals for us the historical context and purpose of the Gospels and their authors. Dr. Pitre brings an ancient freshness to the Gospel texts, allowing readers to see each of them from the perspective of their author and those to whom the Gospels were first proclaimed. The Case for Jesus is a helpful resource to anyone studying Scripture or Christology, or to anyone wishing to deepen their relationship with Christ. In the opening chapters, The Case for Jesus tackles the myth that the Gospel’s were anonymously written. Dr. Pitre displays the overwhelming evidence of their authorship and deepens our understanding of each of the Gospels. After guiding us through the historical evidence for the authorship of the four Gospels, Pitre doesn’t just leave us at the doorstep of the New Testament. He then helps us to understand some of the basic Christological questions that may have gone unanswered in our Sunday school classes or even in our religious studies courses, such as those concerning Jesus’ own self-perception. He confirms for us what the Church has taught for almost two thousand years in a manner that is both engaging and is also accessible to today’s laity, making it a great guide for Bible studies and small group discussions. This literary pilgrimage enables readers to encounter Matthew, Mark, Luke, and John as friends. They become close companions in our quest to come to know the Person of Jesus, the long-awaited Messiah and Divine Son of God. As he discusses the Gospels, Pitre also weaves in passages from the Old and New Testaments as well as other sources, helping us to access the deeper meaning behind many of the of Scriptural texts. As I journeyed through The Case for Jesus, the life of Christ was fleshed out for me. I can approach Sacred Scripture with new eyes and greater confidence in my comprehension of the Gospels. Many of the Scripture passages that have always been a mystery to me are now fonts of wisdom for my spiritual life. I highly recommend this work for anyone wishing to gain greater access to Scripture and to the Person of Jesus. 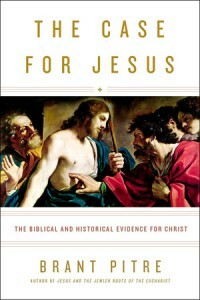 To all who read The Case for Jesus, this book will not only enable you to answer tough questions. It will also be a navigation guide as you read the Gospels and at the same time enrich your life of prayer.